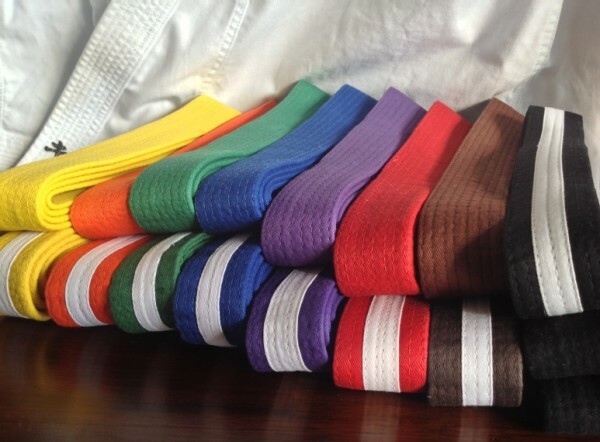 The JKA-SKC Australasia junior grading system consists of 17 levels. It is designed to suit children of all ages. Younger children are required to complete all 17 levels, while older children (at the discretion of the instructor) may be given the opportunity to attempt 2 levels at one grading. This system ensures that all junior karate-ka have achieved the required skill and have reached an appropriate age before attempting the black belt exam. Special requirements: Student must display correct stance. Lunge Punch (oi zuki) 5 times forward in front stance, target sternum (chudan) height. Upper rising block (age uke) 5 times forward in front stance. Special requirements: Student must display good form and posture. Lunge Punch (oi zuki) 5 times forward in front stance, target sternum height. Special requirements: Student must display good form and posture. Which includes stance depth,length and width. Also the student must be able to demonstrate the two hip positions. Half and full facing. Attacker steps forward 5 times punching face level target (Jodan) defender step backward blocking upper rising block. After the 5th attack the defender counter strikes with a right reverse punch. Attacker steps forward 5 times punching sternum level target (chudan)defender step backward blocking Outward/inward block. After the 5th attack the defender counter strikes with a right reverse punch. Kata application: Movement 4 of Heian Shodan. Wrist hold escape. Both right and left side. Special requirements: Student must display good form and posture. Which includes stance depth, length and width. Also the student must be able to demonstrate the two hip position. Half and full facing. Student must be able to perform first Kata (Heian Shodan). Application of movement 4 of (1st) Heian Shodan. Wrist hold escape. Both right and left side. Back Break fall five times. Special requirements: Student must display good form. In addition the student must display focus in all movements. Student must be able to perform first Kata (Heian Shodan) and the first 11 moves of second Kata (Heian NiDan). Back break fall five times.Escape from two handed wrist hold. Cross grip wrist hold. Scarf hold. Demonstrate this on both sides of the body. Special requirements: Student must display good form and focus. In addition the student must display be able to show hip rotation in all combinations. Age uke/gyaku zuki – Upper rising block reverse punch 5 times backwards in front stance. Attacker steps forward 5 times punching face level target (Jodan) defender step backward blocking upper rising block. After each attack the defender counter strikes with a right reverse punch. Attacker steps forward 5 times punching sternum level target (chudan)defender step backward blocking Outward/inward block. After each attack the defender counter strikes with a right reverse punch. Student must be able to perform first Kata (Heian Shodan), second Kata( Heian Nidan) and the first 10 moves of third Kata (Heian Sandan). Back break fall five times, Side break falls both left and right. Escape from the following; two handed wrist hold, cross grip hold, front throat choke, rear throat choke. Special requirements: Student must display form, focus, hip action. In addition the student must display be able to show hip rotation in all combinations. Student must be able to perform first Kata (Heian Shodan), second Kata( Heian Nidan) and third Kata (Heian Sandan). Kata application: Movement 4 of Heian Shodan.Wrist hold escape both left and right side. break fall five times, Side break falls both left and right. Escape from the following; two handed wrist hold, cross grip hold, front throat choke, rear throat choke. Bear hug arms pinned from behind. Scarf hold, side body control. Special requirements: Student must display form, focus, hip action, speed. In addition the student must display flow in techniques. Round Kick (Mawashi geri) – 5 times forward in front stance. Each attack is performed twice. Once on the right and once on the left. Defender must effectively block and counter each attention. Attention should be paid to direct distancing. Student must be able to perform first Kata (Heian Shodan), second Kata (Heian Nidan), third Kata (Heian Sandan) and the first 13 moves of fourth Kata (Heian Yondan). Kata application: Movement 4 of Heian Shodan. Wrist hold escape both left and right side. Student must be able to perform first Kata( Heian Shodan), second Kata( Heian Nidan), third Kata( Heian Sandan) and fourth Kata( Heian Yondan). Scarf hold, side body control. Cross body control. Shoulder throw. Student must be able to perform Heian Shodan, Heian Nidan, Heian Sandan, Heian Yondan and the first 12 moves of fifth Kata (Heian Godan). Student must be able to perform Heian Shodan, Heian Nidan, Heian Sandan, Heian Yondan and Heian Godan. Age uke/gyaku zuki – Upper rising block reverse punch 5 times backward in front stance. Uchi uke/kizami zuki/gyaku zuki – Inward/Outward block/jab punch/reverse punch 5 times backward. Block in back stance, punches in front stance. Two level front kicks (nidan geri) step through and perform two continuous front kicks at speed. Kick with the back leg first. Student must be able to perform Heian Shodan, Heian Nidan, Heian Sandan, Heian Yondan, Heian Godan and the first 15 moves of Tekki Shodan. Consecutive kicking (Mae ren geri). Start by kicking with the front foot first then quickly step through and kick with the back leg. Mount position. Outer reaping throw (O soto gari). Arm bar from the mount, ashi barai (foot sweep). Student must be able to perform Heian Shodan, Heian Nidan, Heian Sandan, Heian Yondan, Heian Godan, Tekki Shodan and a favourite kata selected from Bassai dai, Kanku dai, Hangetsu, Empi or Jion. North South hold down. Around the clock control, all throws from previous gradings, blood choke, air choke. Scarf hold, side body control. Cross body control. Shoulder throw. Hip Throw.